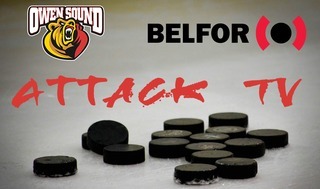 The Owen Sound Attack face another busy weekend to conclude week 7 of the OHL Season, as the Bears will play 3 games in 3 days again. Coming off of a fairly success weekend that featured 2 wins and 1 loss, the Attack will look to add to their 8-6-0-1 record on Friday night in Oshawa as they take on the Generals. Oshawa has gotten off to a fairly strong start to the season, going 8-5-1-0, despite currently sitting 3rd in the Eastern Division. The Generals feature a very potent offence, with players such as Allan McShane; a native of nearby Collingwood, leading scorer Jack Studnicka, Swiss sharp-shooter Nando Eggenberger, and son of former Toronto Maple Leaf, Danil Antropov. Friday’s game will mark the 2nd matchup of the season between the 2 clubs, with the Attack winning the rubber match 4-2. Puck drop is at 7:35pm, and fans can watch the action on Rogers Local Channel 53, or listen on 560 CFOS Kia of Owen Sound/Terry’s Trailer Service Bear Radio. Following the game, the Attack will head home to face the London Knights on Saturday evening. This will be the 3rd game between the fierce rivals, with each team having won 1 game so far. The Attack will look to take advantage of home ice, as they were able to beat the Knights 4-3 at home a few weeks ago, and currently boast a 6-2-0-1 record at home this season. The Knights current leading scorer is assistant captain Cole Tymkin, who has 7 goals and 8 assists in the team’s first 13 games. Rookie defenceman Adam Boqvist has caught fire as of late recording 7 points in his last 4 games. Boqvist was the 8th overall pick in last year’s NHL Entry Draft, taken by the Chicago Blackhawks. The Knights also feature 2 strong goalies in over-ager Joseph Raaymakers, and Vegas Golden Knights’ draft pick, Jordan Kooy. Kooy currently leads the league in both goals against average and save percentage, with a 1.84 and a .936, respectively. 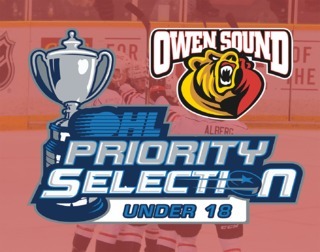 Owen Sound will be back on the road on Sunday morning, as they will head down to Hamilton to play last season’s OHL Champion Bulldogs. The Dogs have started the year a modest 7-7-1-0, but were able to fight off the Bears in their first meeting; winning the game 7-6 in a shootout. Over-ager Brandon Saigeon leads the way in scoring for Hamilton with an impressive 25 points in 15 games. His right-winger, 2019 draft eligible Arthur Kaliyev, has been turning heads, posting 14 goals and 10 assists through 15 games. Captain Mackenzie Entwhistle has had a solid start to year as well, and recently signed his entry-level contract with the Chicago Blackhawks. 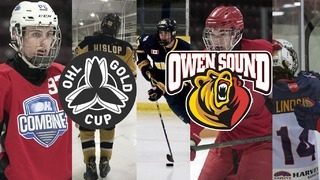 Puck drop is at 2pm, and fans will be able to tune in to watch the Bears on Rogers Local Channel 53 or listen on 560 CFOS Kia of Owen Sound/Terry’s Trailer Service Bear Radio. NHL draft eligible goalie Mack Guzda will look to continue his success, coming off being named the Huron Tractor Supply Player of the Week for week 6. Guzda won both games he played in, posting an impressive .923 save percentage. Assistant captain Kevin Hancock still leads the team in points, with 10 goals and 11 assists in 15 games. Rookie defenceman Nolan Seed will be absent from the Attack’s lineup this week, as he is currently in New Brunswick with Team Canada’s Under 17 team. Joining Seed is Attack prospect Josh Barnes, who has started the season with the Cornwall Colts of the CCHL. 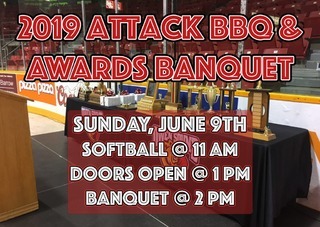 Tickets can be found for both the Saturday game online at www.attackhockey.com, by calling 519-371-7452, or at the MacVicar & McComb ReMax Attack Box Office located in the Harry Lumley Bayshore.